Textbook of Adult Emergency Medicine provides clear and consistent coverage of this rapidly evolving specialty. Building on the success of previous editions, it covers all the major topics that present to the trainee doctor in the emergency department. In addition it will prove invaluable to the range of other professionals working in this setting - including nurse specialists and paramedics - who require concise, highly practical guidance, incorporating the latest best practice and current guidelines. As well as covering the mainstream clinical subjects - including cardiac, respiratory, gastrointestinal, neurology, musculoskeletal, infectious disease, toxicology and psychiatry emergencies, resuscitation and trauma - there are major sections on other skills and issues of key importance to today's advanced emergency medicine practitioner, such as staffing, overcrowding, triage, patient safety and quality measures. In addition, difficult topics such as death and dying, the challenging patient, ethics, giving evidence and domestic violence are covered. This edition comes with an enhanced electronic version with video and self-assessment content, providing a richer learning experience and making rapid reference easier than ever before, anytime, anywhere. 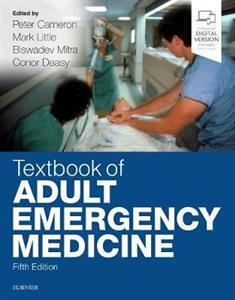 A comprehensive textbook of adult emergency medicine for trainee doctors - covers all the problems likely to present to a trainee in the emergency department. Chapters are highly readable and concise - boxes summarise chapter key points and highlight controversial areas of treatment. The content is highly practical, clinically orientated and thoroughly updated in all the core subjects The book has comprehensive coverage of non-clinical issues such as administration, quality improvement, research and training. The online ExpertConsult ebook includes over 500 self-testing questions related directly to the contents as well as online videos on topics such as central venous line placement and cricothyrotomy. Two new editors join the book including one based in Ireland. There will be a thorough update to the content especially in the areas of trauma and resuscitation. Improved imaging will be included. Additional online self-testing questions will be included.